Today I was gifted with several holograms. Yes. Holograms. 3-D images in plates of glass. They look very cool on my mantelpiece. A dolphin's tail bursts out at you. 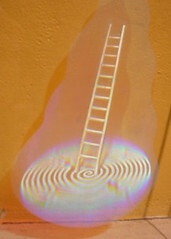 A small ladder climbs into the air. Perhaps photos later, if they're photographable (by me, anyway). The gifts came from these artists, who are, sadly, leaving Columbia. Update: A photo of one of the holograms. You're looking at an image of a 3-D image.